Culinary chefs can become a great target audience for your business initiatives if your services and products can help them perform their tasks better. 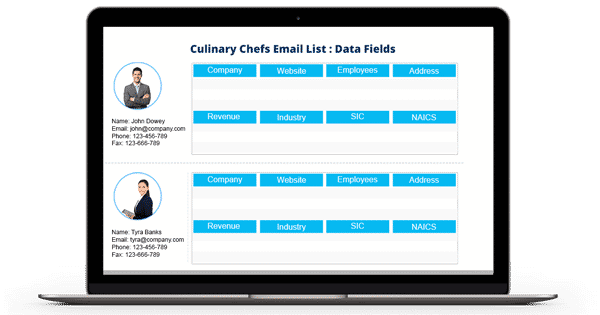 If you are business professionals or marketer desiring to sell your services to the culinary chefs, Blue Mail Media’s Culinary Chefs Mailing List will help you reach them successfully. Our Chefs Email List helps you in reaching your most significant buyers in the food and beverage industry. This list encompasses contact details of chefs, executive chefs, food and beverage directors, kitchen managers, and other professionals engaged in the purchasing and supplying of services to the hotels and restaurants across the globe. Avail this list and empower your marketing campaigns with the insights of an actionable marketing data! Different kinds of businesses need different kinds of data as per their goals, requirements, and challenges. And thus, Blue Mail Media facilitates you with the luxury of availing pre-packaged as well as customized Executive Chefs Mailing List. Comprised by using the most trusted sources, this database is a one-stop solution to all your marketing initiatives. We offer highly accurate, verified, and updated Culinary Chefs Business Mailing List. You can get this list customized according to the various customization options such as SIC/NAICS codes, locations, company name, revenue, etc.